United States President George Bush announced on Friday that the will sign a 168 billion US dollars economic stimulus package approved by the Senate that he said is needed to help boost the slowing economy. The announcement came as an AP-Ipso public opinion poll revealed an all time low support for President Bush and the US Congress. In the latest example that the U.S. dollar is not what it used to be some shops in New York City have begun accepting Euros and other foreign currencies as payment for merchandise. Exhausted White House hopefuls launched one last frenzied day of campaigning before a 24-state Super Tuesday - the biggest one-day White House nominating contest in history. United States has seen the first decline in employment since August 2003, providing fresh evidence that the US economy could be entering a recession. Employers cut 17,000 jobs from their payrolls in January, Labor Department figures showed. Economists had been expecting a rise of 80,000. 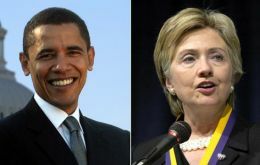 The historic choice for the Democratic presidential nominee came into clear focus at the final Democratic debate Thursday between the two candidates left standing - Barack Obama and Hillary Clinton - who smoothed over their recent spats and turned most of their attacks on Republicans. United States economic growth fell sharply in the last three months of 2007 as the credit crunch took effect, according to the latest figures from the Department of Commerce. Overall growth rate in 2007 was 2.2%, the weakest since 2002. The FBI is investigating at least fourteen companies embroiled in the sub-prime mortgage crisis as part of a crackdown on improper lending and inside information according to The Wall Street Journal. The Federal Reserve has cut interest rates for the second time in nine days in a further attempt to keep the United States economy from entering a recession. However a barrage of negative data on US growth, housing and employment seems to have watered the reaction from markets. United States President George W Bush urged his fellow citizens on Monday to have confidence in their economy in the long-term as he gave his seventh and final State of the Union address in Capitol Hill.